A new exhibit titled, “Changing Seasons,” by local artist Carole Hunnes-Nielsen, opens at the Leep Art Gallery on January 3 at the Postma Center on the Pine Rest Christian Mental Health Services campus in Grand Rapids. Hunnes-Nielsen spent 30 years teaching high school art. 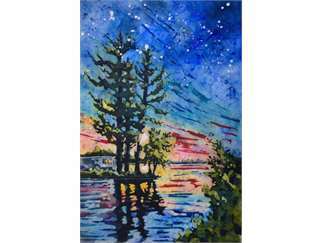 As a retired art teacher, she enjoys sharing her love of art through teaching watercolor batik workshops. She is a member of the American Watercolor Society, Michigan Watercolor Society and the Franciscan Painters. She has had numerous solo exhibitions and has been in many juried shows. Hunnes-Nielsen is a lifelong Michigan resident and currently lives in Rockford. The Pine Rest Leep Art Gallery exhibit will be on display at the Postma Center located at 300 68th Street, SE, Grand Rapids, Mich., from January 3 until April 3, 2019. The Leep Art Gallery is open Monday through Friday 9 a.m. – 3 p.m. and is free and open to the public. For more information, please call 616.222.4530 or go to www.pinerest.org/leep-art-gallery.